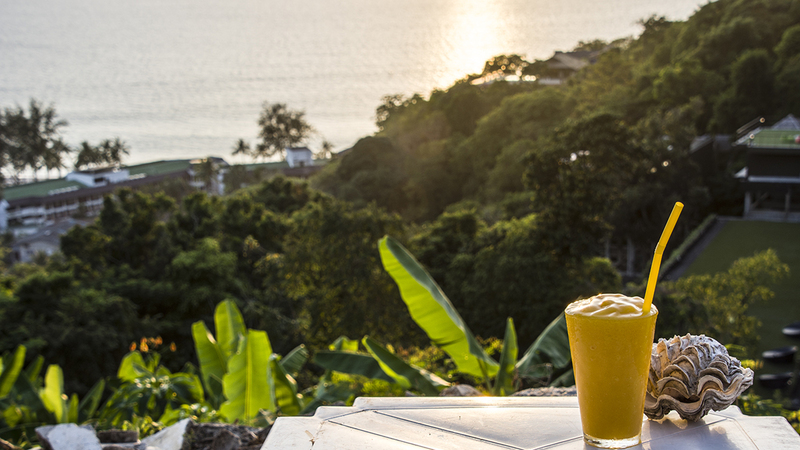 Drinking a mango smoothie and watching the sun set over the Andaman Sea in Phuket. 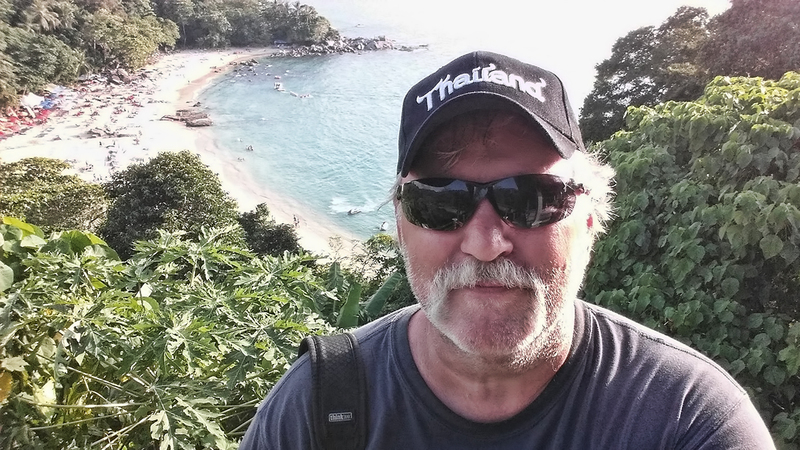 After watching the sun set, and sipping on a mango smoothie the night before, at a beautiful little bar on a cliff not far from Nai Harn Beach, I woke up the next day wanting to continue my trek up the western coast of Phuket. 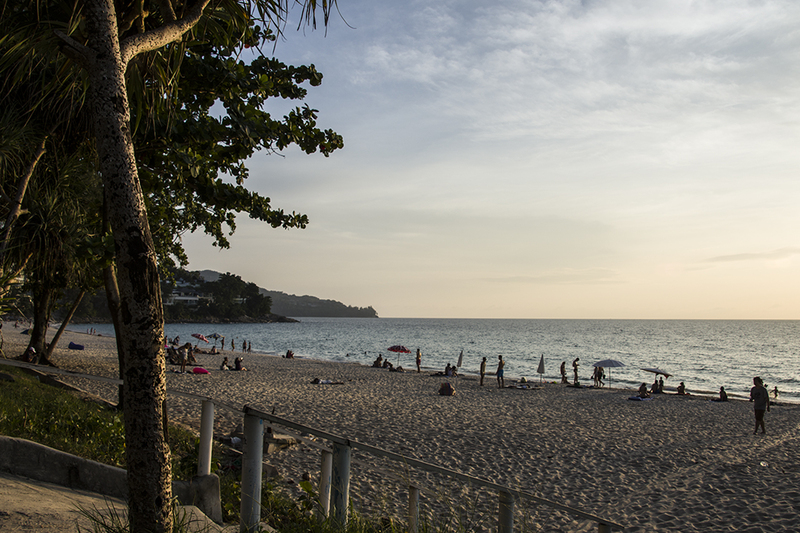 Next in line, would be a couple more amazing and beautiful beaches, Kamala and Surin. My first trip to Kamala was two years ago by bus, and was only for a few hours, so I was really excited to see a lot more of this place. I had walked around the town a bit then, taken a stroll to the beach, and knew I had really liked what I had seen, so I was definitely looking forward to spending more time investigating the area! I remember there were several good eateries and cool bars on the main drag through town, but it’s the side roads winding down to the beach that really give a person a sense of the character of this seaside town. I rode my motorbike through those streets, and will be posting videos in the coming weeks of Kamala and other beaches I adventured through during my time on Phuket. If you come to Kamala on a Friday, you will find the bigger of the two street markets that serve the town. This is the market I went to, and found a lot of great Thai food, fresh fruits, and lots of souvenirs. You can find it “HERE” under “Friday Market in Kamala,” about half way down the page, with a Google map giving directions to the market. The food was actually very good and I would give the eating establishments a big thumbs up! 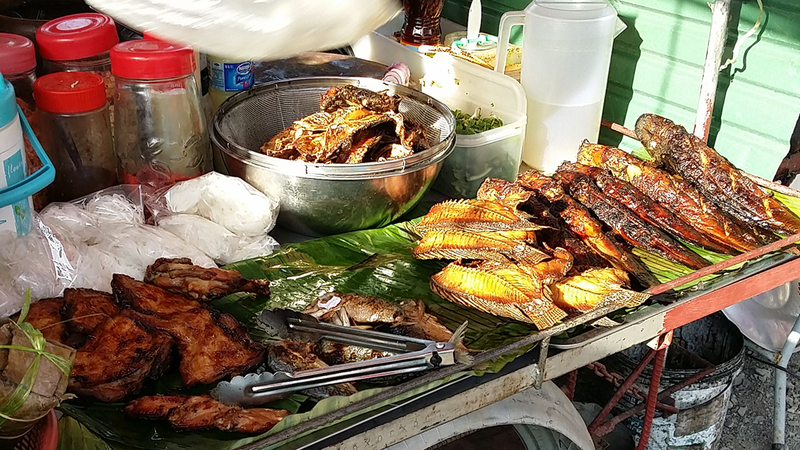 Fresh cooked fish at the Kamala Market. After filling my stomach with some food, I decided I needed a new pair of sunglasses and a baseball cap. I had already been pricing these items in Phuket Town so I was able to walk away with a pretty good bargain for the two items by haggling. Never be afraid to ask for a discounted price, special sale, whatever! And, being the first buyer of the day can also produce a great price for you, as most vendors believe the first sale brings them good luck, so they will give a really good discount to make that first sale! The other market, I have been told, is a bit smaller, and sets up on Wednesdays and Saturdays if you are in the area on either of those days. 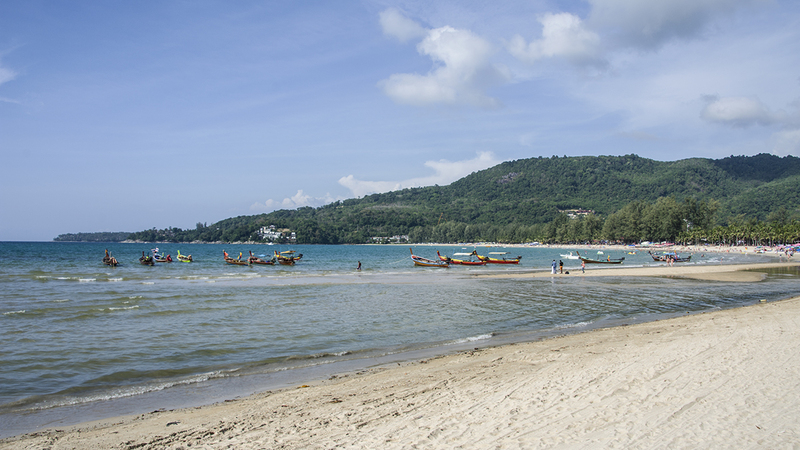 Laem Singh Beach, a private beach between Kamala and Surin. 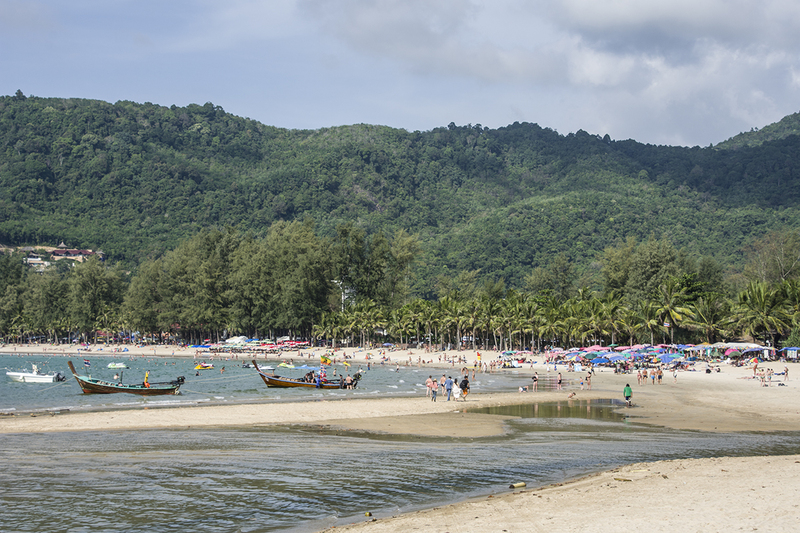 At the top of the hill between Kamala and Surin beaches, you will find a viewpoint that looks down over a beach called Laem Singh Beach. I am not sure of the history of this beach, but now it is private. It does look like a very beautiful beach, as you can see by looking over my shoulder in the photo I posted. But, there are a lot of beautiful beaches on the island, so I decided to skip the 150 baht or approximately $4.50 USD, and move on to Surin Beach. 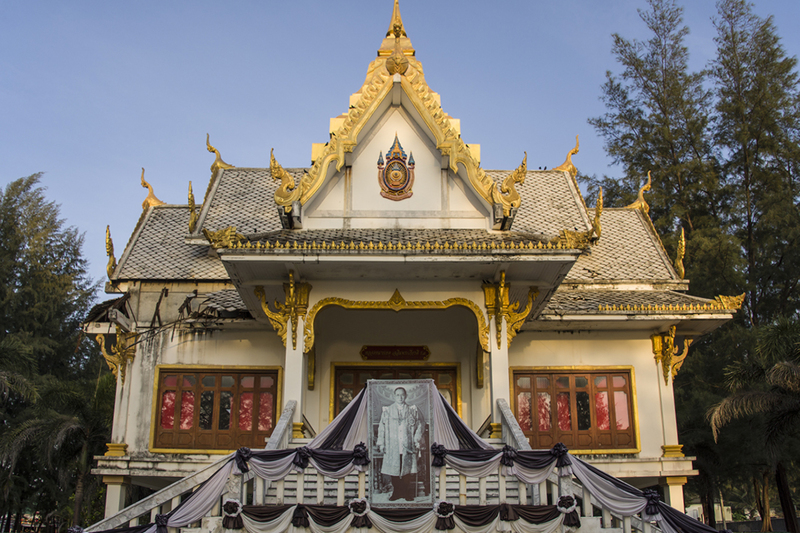 Wat Surin Temple is under construction, but has a memorial to King Bhumibol Adulyadej. This would be my first time visiting Surin, other than passing through here two years ago on my way to Kamala. I decided to make my way down to the ocean, as the sun was setting on another day, and what better place to watch that than at the beach. I really liked this location, as it seemed very peaceful, with not a lot going on. I decided this would be a great place to pull out my camera and take a few shots of the setting sun. I was also lucky enough to meet a very nice fellow traveler, and after talking and watching the beautiful sunset together, we decided to share some of the great local Thai food at one of the restaurants in town. 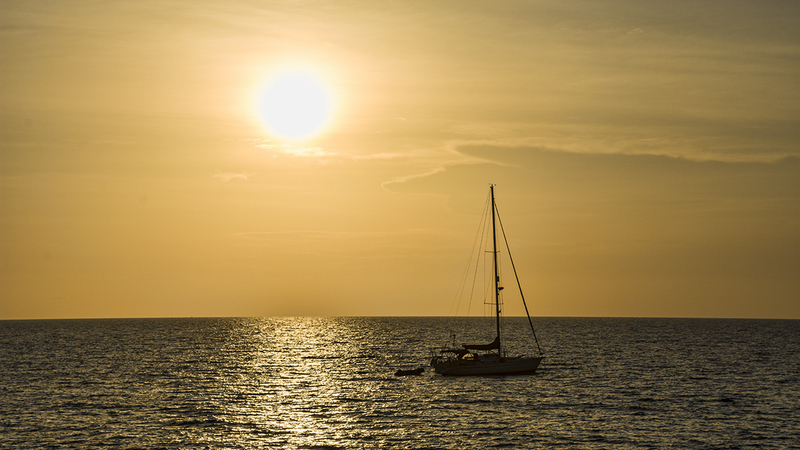 What a nice way to end another great day on the island of Phuket. So far my time here had been amazing, and I was pretty sure that would continue. The beaches are easily some of the best in the world, and traveling around on a motorbike turned out to be far easier than I had ever anticipated. Looking out over Surin Beach at Sunset. One thing to remember, though, you should ALWAYS wear a helmet. Not only will it protect you if you fall, but if you are not careful you can fall victim to the local police helping you part with your money if you aren’t wearing one at one of their checkpoints. I would also advise buying a better helmet than you are handed when renting a bike. For $10 or $15 USD, you can get yourself a pretty comfortable helmet that will protect you if you do some shopping around. I found one for that price, and it was one of my best investments of the trip as I took it with me all over Asia. Well, that takes me to the end of this blog, I hope everyone enjoyed it, and continues to enjoy all my stories and photos! I will be back in two weeks with another post on more of my adventures around Southeast Asia. So long for now, peace out!